If you're coming from Gratefully Vintage, welcome! We always come away filled with great inspiration when we visit Kellie's beautiful home! Love what she has done for the holidays! There are 21 days until Christmas! 3 weeks people! And if you love the holiday season like we do, you probably look forward to the lights, the Hallmark movies, and the FOOD! There's usually always some great food involved this time of year. 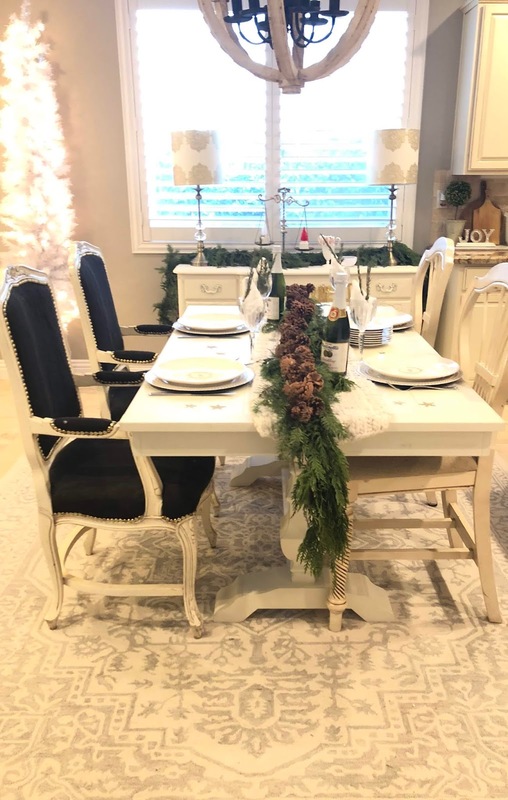 It's nice to make things extra special around this time of year, and creating a beautiful table is one of the ways to add something extra to our homes for the people we love. Instead of a separate dining room, we removed our dining room table a couple of years ago because we rarely used that space—the "dining room" is now the piano and gathering room! We use our kitchen/family room area as our dining room which works great for us. 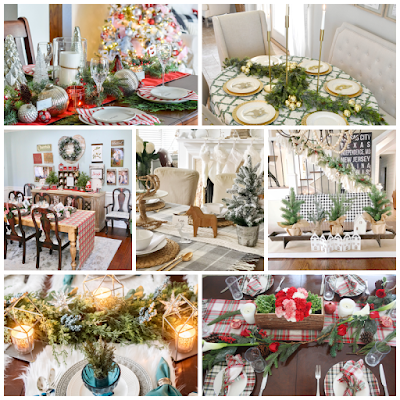 Using fresh garland is a great way to dress a table for any holiday occasion. No need to add anything to it as it is already so beautiful as is! 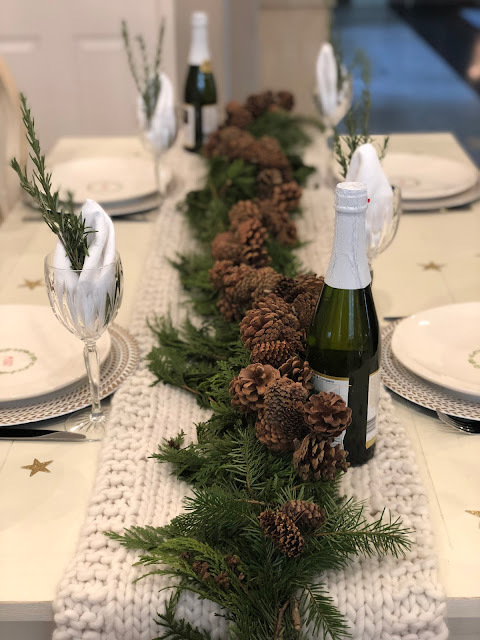 Love how this fresh cedar garland just pops on this off-white crocheted table runner from Home Goods. Garland can be purchased at a local nursery. Adding ornaments is great too! I already had these gold Christmas tree plates on my shelves! No need to buy new! 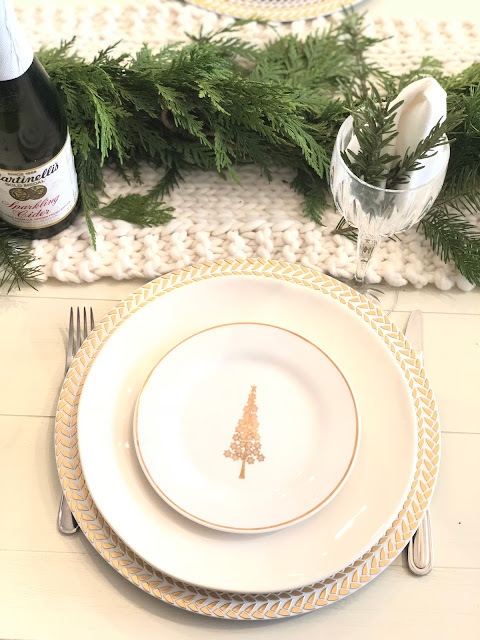 Rae Dunn Merry Christmas plates found at Home Goods paired with these gold chargers from Tuesday Morning. 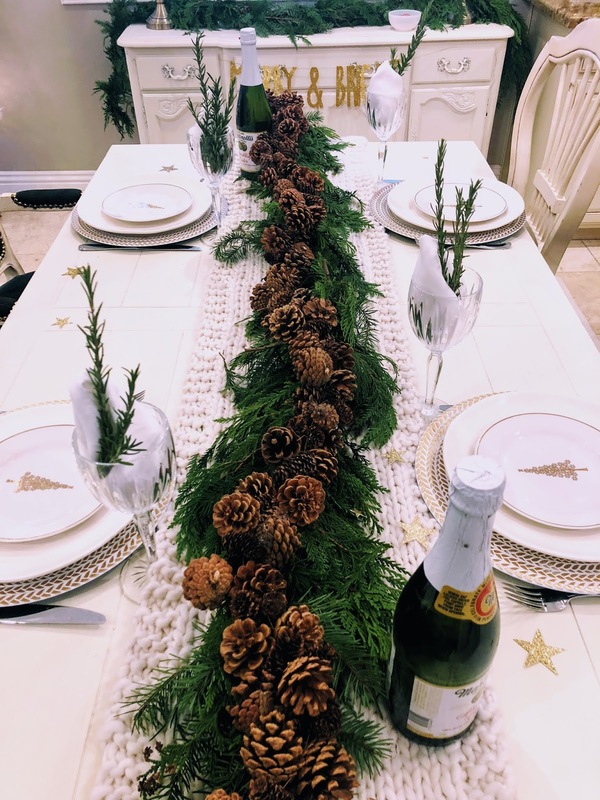 I already had this pinecone garland from www.lovefeastshop.com so I thought I would try it out with this cedar garland and I really loved the look! Shop your own home first, it saves money and time. Added these gold stars to the table for some color and fun! I love stars at Christmastime! I cut some fresh rosemary to add with the napkins for some color and placed them inside the glasses at each place setting. I love how the table turned out and I know my guests would love it! Now I just need to figure out a menu! 1. Use what you have around your home first before you go out and buy new. 2. Use elements from outside if possible. Cut clippings from trees for greenery or flower garden instead of buying flowers from the store. 3. Keep table centerpieces lower in height. You don't want them to be a distraction. 4. 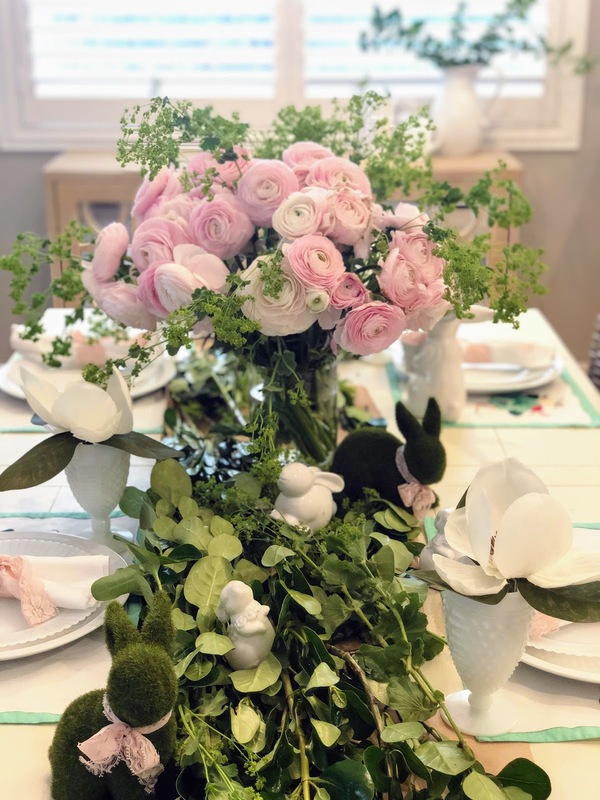 Table centerpieces should be simple and beautiful. 5. 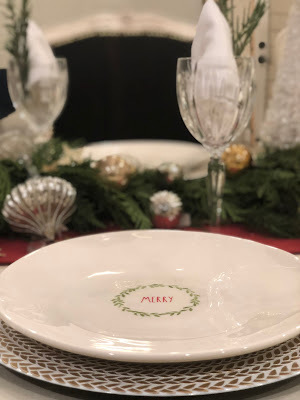 Add name cards to place settings. Don't forget to go to Sarah Sofia Productions to check out her amazing home! Sarah is a pro when it comes to tablescapes! She is a professional event planner so when you plan a party, Sarah is the one to call! 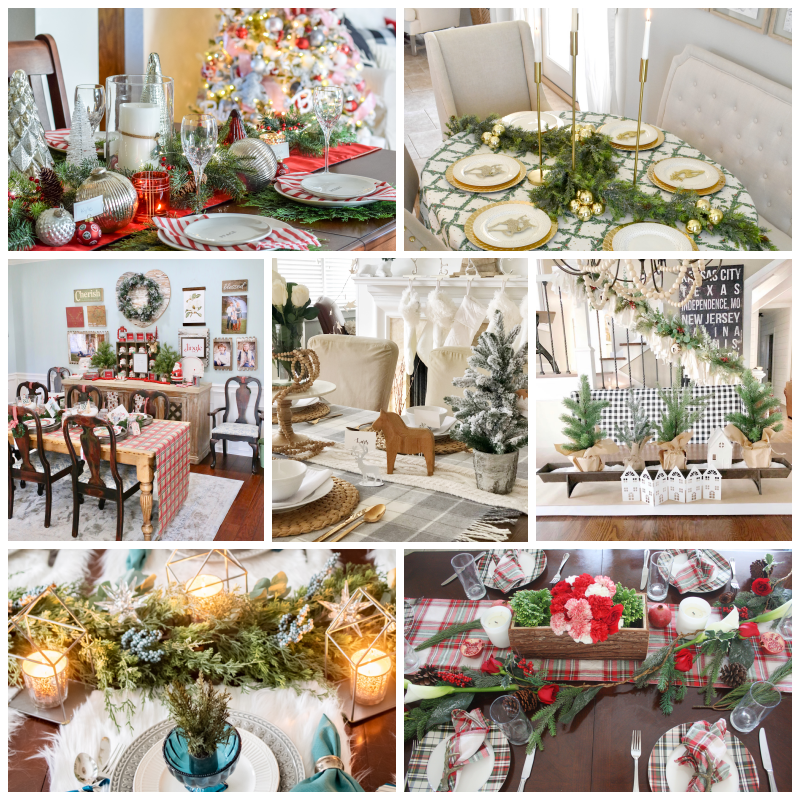 You won't want to miss her beautiful home for the holidays! Thanks for stopping by my tour! Leave me a comment and let me know what you loved!